During the season in which we celebrate Christ’s birth, it is natural to want to be more like Him, to try to live the way He lived—selflessly and generously. But how did Jesus Christ come to be who He was? How did He come to embody these attributes that we try so hard at Christmastime (and should try all the time) to emulate? As the literal Son of God, He received the gift of mortality from his mother, Mary. Mary would have been the one to teach Him to walk and talk. She would have been the one to dry His tears and smile when He laughed. Hers would have been the face He first saw expressing the love of God. Mary—called upon to nurture the Savior of the world—is a remarkable example of quiet, resilient faith and courage in the face of adversity. As we celebrate Christmas, it is fitting to consider what we know about Mary in the Nativity story and determine what characteristics qualified her for her tremendous calling. What was it about her that made her capable of such responsibility? What might we learn from Mary that will help us in our own journeys? Mary Holland McCann is the daughter of Elder Jeffrey R. Holland and Patricia T. Holland. She is the mother of five children and lives in Utah County. I think every mother should have a copy of this book in their home! I love how Mary's experiences become relatable through Sister McCann's insight. 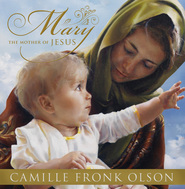 This sweet, simple yet profound book brought new understanding and appreciation for the Mother of our Savior as well as motherhood in general. Highly recommended!